It cracks me up that people feel the need to refer to Zoidberg by his first name. Because John is so unique, I knew exactly who you were talking about at first. I too am curious to see how the others look in this segment. Particularly Zoidberg - I wonder if they're in this style at all, and if they are, perhaps they're villains or different creatures. Come to think of it, Kif would look pretty awwesome like this. I'm guessing they'll save him for the GI. 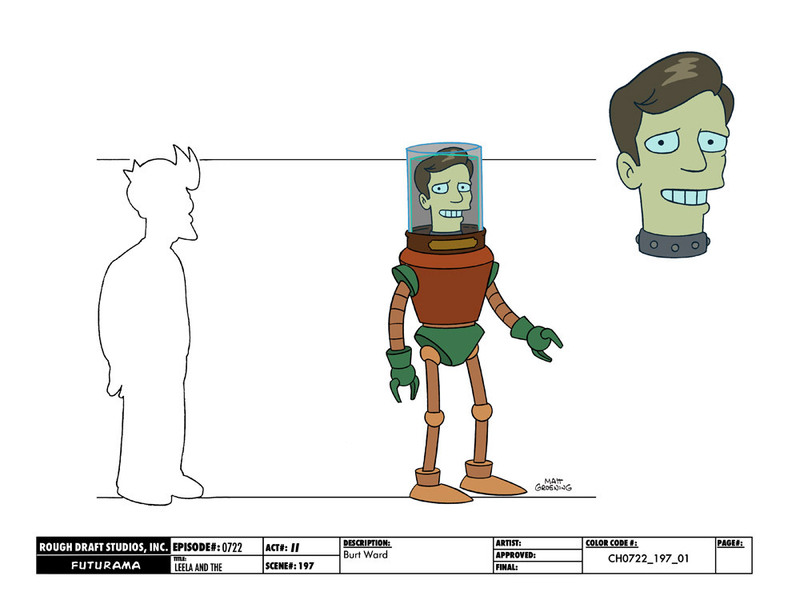 Joe segment though, since it appears this one will be more Fry/Leela based. Oooh, I do love bender's outfit there! So we should be getting a look at "Leela and the Genestalk" today. I wonder if that demonstratively cute style is used for an overly mean plot. 21 days until the new season starts. Can I get a Sweet Zombie Jesus? Or if his favourite superhero is the CatMan. Burt's robo-body is super neat. I'm really interested to find out how these characters are relevant to the story at all. Adam and Burt's designs feel like the old stuff! "Leela and the Genestalk" is one of the episodes I'm most looking forward to based on what little we've seen so far, and those designs make me even more excited about this one. Nitpick time: The jar-lines on Burt's head aren't quite right. The back one should be behind his hair; not in front of it. I'm now eagerly looking forawrd to this. That could be the front line too, though. The "front" line is the one that runs parallel to the lighter one beneath it. The "back" line should indeed be behind Burt's hair. UrL is right. I feel like this sort of mistake should have been caught before the image was released to the public. I feel like this sort of mistake should have been caught before the image was released to the public. Well it is only concept art, they have probably revised it since. You can even see that the concept art for Tarquin says "revised" on it too. I'd like to see you justify the phrase "only concept art" to Ralph McQuarrie. I wasn't trying to say it's not important, I'm trying to say that it may not be the final version. No, you were trying to say that a mistake in the image was acceptable. Just because it's not the final version (and it doesn't make sense that they'd be releasing versions that we won't see in the finished cartoon, unless there were a whole sequence of them) doesn't mean that they should spend any less effort on realising it. 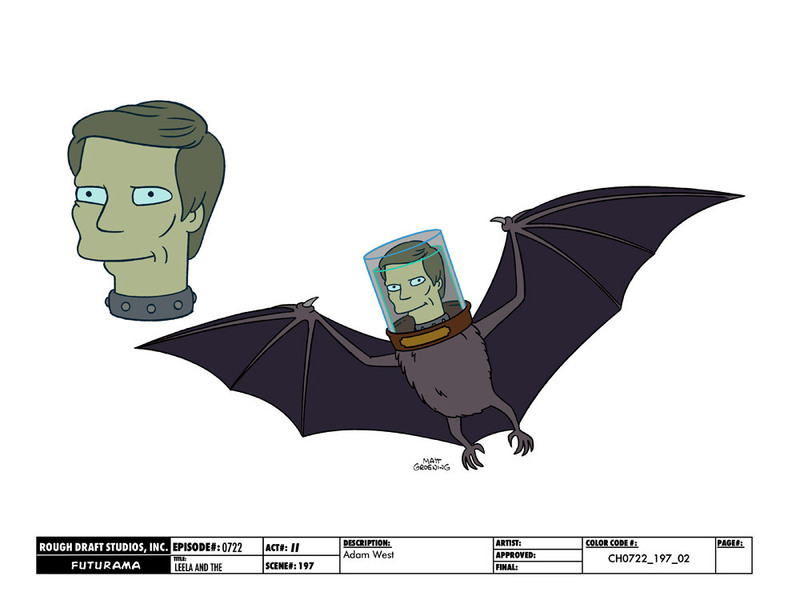 I mean, some of the very first concepts for Bender are given absolutely spectacular treatments that would have been quite worthy of being in Futurama. That's back when they had a bigger budget though, so perhaps sloppy workmanship has become the order of the day with a reduced amount of money available. Stop being so quick to defend mistakes. By all means, defend Futurama, but mistakes happen (and animation goofs were common in Season One, before the team settled into what they were doing properly), and they shouldn't be defended for the sake of it. The creative team behind Futurama aren't perfect, and it's okay that they have flaws. Accept them, don't dwell on them. If your idol has feet of clay, it's better to be aware of that than to have it come as a complete shock when it falls over and crushes you. Well that was a tad over the top, way to take a harmless comment out of hand and create a full on rant. Well, I hope you've learned to make your comments less harmless in future. Are you sure you're looking at it right? I think the jar is tilted forward. Check out the base of the jar--the front runs below the back of the jar. The lower line is the front, and should be in front of the hair. The higher line is in the back, and would be behind the hair (if the back line and the hair overlapped in this picture, which it doesn't). Also, tell me why we are arguing over such a stupid subject. There is something seriously wrong with us! Also also: are those jars within jars? I am so confused. Final point: comparing anybody to Ralph McQuarrie is just unfair. The interior line denoting the front of the jar (the paler blue line, inside the darker ones) runs parallel to the higher (darker blue) line, meaning that the higher line is out in front. The darker blue line completing the curve of the jar is therefore the rear of the jar, and should be behind the hair. The jar is not tilted forwards, otherwise that paler blue line would have a slight downward curve, rather than an upward one. The lines at the base of the jar have a slight downward curve due to the perspective of the drawing being constructed so as to place the viewer on eye-level with the figure, rather than looking up from below or down from above. We have nothing better to do, and yes. There is something seriously wrong with most of us. That's how the apparent thickness of the glass is shown - it makes the picture slightly more realistic than simply drawing a single line would. The interior line is where the liquid meets the glass, and the exterior line is the edge of the glass, at the point where it meets the exterior environment (usually air). Ralph McQuarrie being dead and thus unable to produce any more work is unfair, and the best evidence yet that the universe hates us all. The straight line might be a one sided contination of the black line, comparing Fry's and Burt's size. Burt Ward does have in fact two sizes: The jar's limit, as well as his head's limit. Therefor, it does make sense to add such a comparison line closer to the head itself, and not stop outside the glas. (Of course, I just said "It makes sense". I didn't not say the whole thing could not yet be a design mistake, after all). There are no continuations of the sizing line within the drawing of Burt. The lines that make up the jar are all a part of the way that the jar is drawn. If guest-appearances by Adam West and Burt Ward and a country line-dancing scene don’t sell you on this episode, there might not be any hope for you. Just downloaded and zoomed the image. Yep, it's really just the front waterline in the back, and the back waterline in the front. Country line-dancing doesn't sound so good nor the rodeo thing in trailer (although it was funny). But I'm not disliking the episode because of that. It's probably only the beginning of the episode. It appears the Professor isn't moving. I'm especially curious about "Leela and the Genestalk" now; neither of the images we've seen appear related to the brief episode description, whereas the preview pictures for the other episodes so far have been very clearly tied to the one they're going to be in. I'm really looking forward to seeing how Batman and country line-dancing are related to Munda's back story. Also, I'm guessing this will be the episode with "Lamy" in it; I'm actually excited to see Amy and Leela working together again and not bickering. 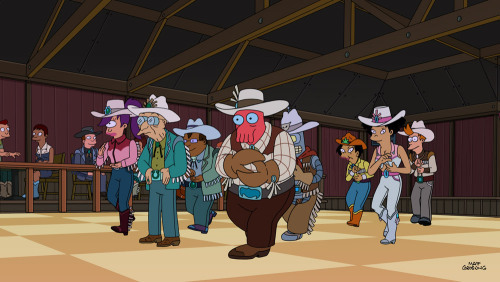 I want a cowboy Zoidberg toy.. now!!! So it's pretty obvious that the line-dancing and bucking bronco scene with the Professor take place on Mars, further backed-up by the presence of Inez.